See that stack of paper? You're looking at the printed final draft of my book, Then I Became a Mother. Occasionally I refer to the book by its acronym: TIBAM. Of course, you've got to pronounce it correctly. The stress obviously goes on the second syllable. TI-BAM! Feel free to imagine me saying this while giving my thigh a good-natured slap. Or, you could envision its use in a comic where the superhero freezes time and meets all of the physical, emotional, intellectual, and social needs of her children while simultaneously preparing a nutritious dinner, completing an elaborate craft from Pinterest, and reaching the end of the day without one stain on her clothing. But most often, I find myself saying TIBAM throughout the day when I notice something about my environment -- or something about myself -- that wasn't evident seven years ago before I became a mother. When I slide open the top rack of the dishwasher and realize that every single item is either a plastic bowl or plastic cup, I shake my head and chalk it up to TIBAM. When I memorize the PBS cartoon lineup, it's because of TIBAM. When I'm woken at six in the morning by a child who urgently wants to know whether it's true that the national bird is an eagle, TIBAM is written all over it. Ditto for when a child discovers that a stamper works on her sister's head. Or when the child sitting in the back of the minivan shouts "DUCK!" each time we drive beneath an underpass -- and I repeatedly comply with the request. When I station myself at the kitchen table to help my oldest daughter with her nightly math homework or find myself spending a Friday evening at the sidelines to watch soccer practice, it's due to TIBAM. When I rummage through my purse in search of my car keys but instead find a diaper, a naked Barbie, Goldfish cracker crumbs, and a pine cone, TIBAM is at work. When I see the young mother in the supermarket -- the one hushing her crying newborn, the one who feels like the walls are closing in on her, the one who hasn't yet had the chance to learn from experience that the cries aren't as upsetting to anyone else as they are to her -- I want to hug her and tell her that it's going to be okay, because, well, TIBAM. When I understand that it's possible to be equally thankful for bedtime at night and awestruck by little faces in the morning, I utter a quiet TIBAM. When I find myself rushing some of these days to escape their tedium and when I desperately cling to these days to soak up their goodness, I know that it's all part of TIBAM. Then I became a mother. TIBAM! It changes everything, doesn't it? 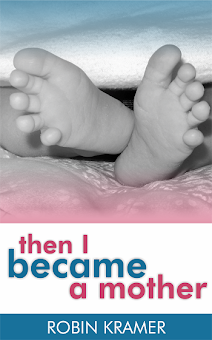 Update: Then I Became a Mother is now available in both Kindle and paperback editions. Humor, hope, and encouragement for moms. Enjoy! I love this! You had me cracking up. It is all so true. So happy for you and your book!!! An I love the idea of TIBAM moments!!! I'm up in the thick of it, Girlie. Excited for you. I just like that word: TIBAM. Such a ring to it, right? Thanks for the warm wishes, Lisa! Why thanks! I hope that you will! I am so excited for you! Awesome job!! I'd love to know if this ever comes out on e-book or if you release it in South Africa...otherwise I'm going to have to bribe my parents back home to ship me a copy ;-) Amazing word....it is now added to my vocab! i can't wait to read it! This post made me cry...because I feel the same exact way every day:) Nothing is better than a sleeping child...however, the same goes for the first greeting of the day. Before you are stressed out, tired and agitated. Thanks, Mandy! I can't wait to have you read it! Where will your book be sold? I think I am going to need 6 copies! Justina, it will be available via Amazon, and I'll be sharing all the links and websites soon! Thanks so much!